Persistence Market Research has unveiled an all-embracive research report titled “Plasma Cutting Equipment: Global Industry Analysis (2012-2016) and Forecast (2017-2026),” which traces the expansion of the global plasma cutting equipment market till date and delivers presumptive scenarios for its growth over the forecast period, 2017-2026. Key companies manufacturing plasma cutting equipment can avail this exclusive market study and assess the inferred forecast to enhance their understanding on the market’s subjective undercurrents and develop informed strategies for the future. Revenues procured by market players over the recent historic time frame have been aggregated to develop baselines for market size forecasting. This quantitative information has been infused with qualitative insights to deliver accurate forecast on the expansion of the global plasma cutting equipment market. Industry trends and untapped opportunities have been identified, and their impact on forecasted valuations is reflected in an unbiased and systematic format. The study has been developed to cater to the concerns of each plasma cutting equipment manufacturers in the global landscape. Changing regulations on development of industrial tools & devices, complexities in procurement of raw materials, emergence of new design trends are among the key factors addressed in the report. An extensive analysis on such factors offers a comprehensive understanding on how the production and adoption of plasma cutting equipment will incur transformations in the near future. Pricing, cost structure, and plasma cutting equipment supply chain have been studied in the report. A regulatory standpoint on manufacturing of plasma cutting equipment has been decoded to identify the lucrative avenues and restricted corridors in the global plasma cutting equipment manufacturing landscape. The report has addressed key restraints inhibiting the adoption of plasma cutting equipment across global fabrication industry. New advancements in industrial cutting processes, introduction to advanced operating mechanics, and increasing shift from manual to automatic equipment production have been analyzed to illustrate a technological roadmap that predicts the evolution of plasma cutting equipment manufacturing for the immediate future. Key sections in the report discus the segmental analysis and forecast on the expansion of the global plasma cutting equipment market. The report has segmented the global market for plasma cutting equipment on the basis of equipment-type, applications, and region. Country-specific market size forecasting is also provided in distinct chapters, and the study further offers cross-segmental analysis across multiple parameters. The study offers market size estimations across a range of metrics such as compound annual growth rate (CAGR), Year-on-Year (Y-o-Y) growth rate, and absolute dollar opportunities. The key advantage of availing this report is assessing the interpretations of such valuations on company performances and sales. Key players in the global plasma cutting equipment market have been profiled in this study. Companies have been categorically analyzed and studied to reveal their current market standings. Latest strategic developments of plasma cutting equipment manufacturers have been jotted in a comparative study. Industry leaders as well as market entrants have been profiled in the report. By availing this report, an in-depth competitor analysis can help plasma cutting equipment manufacturers in planning their next steps towards future market direction. Industrial cutting processes have played a significant part in the overall manufacturing of products. From metal foundries to automobile manufacturing, the effectiveness of cutting technologies has been employed across multiple industrial verticals. Among which, plasma cutting methods have gained lucrative grounds in the global industrial landscape. The advantage of using plasma cutting equipment in delivering high-quality cuts at less preparation time has driven their demand as an indispensable industrial equipment. The adoption of plasma cutting equipment has gained traction for their consistency in delivering clean cuts with negligible dross, and across a wide range of operating temperatures. However, complex operability of plasma cutting equipment is a key challenge inhibiting its adoption. Lack of skilled professionals, high maintenance costs and limited application scope are observed as key deterrents for the adoption of plasma cutting equipment. Such factors have been addressed and analyzed in Persistence Market Research’s latest report which delivers a comprehensive forecast on the expansion of the global plasma cutting equipment market for the period, 2017-2026. During this forecast period, the global plasma cutting equipment market is assessed to expand at a moderate pace, reflecting a value CAGR of 4%. In the report, it has been estimated that the global sales of plasma cutting equipment will bring in revenues worth nearly US$ 795 Mn. In the due course of the forecast period, the report has assessed that the global plasma cutting equipment market will witness a growing adoption of mechanized equipment. In 2017, over US$ 280 Mn worth of manual plasma cutting equipment were sold worldwide. However, their adoption is set to dwindle in the latter half of the forecast period. 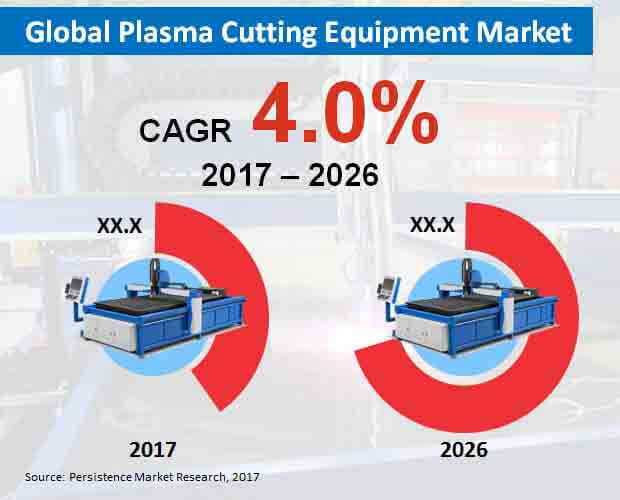 By the end of 2026, global sales of plasma cutting equipment will translate into revenues worth over US$ 445 Mn, registering a steady value CAGR over the forecast period. Operational advantages of mechanized plasma cutting equipment will continue to drive their demand in the upcoming years. Through 2026, majority of plasma cutting equipment manufacturers will be developing equipment that can serve a suite of cutting applications. Heavy equipment fabrication applications of plasma cutting equipment are expected to account for the largest cut of overall revenue pie. By the end of 2026, plasma cutting equipment worth over US$ 170 Mn will be used in fabrication of heavy equipment across the globe. The report also reveals that the demand for plasma cutting equipment in shipbuilding & off-shore industry will gain traction. Over the forecast period, the shipbuilding & off-shore applications of plasma cutting equipment are expected to reflect fastest revenue growth at a CAGR of 5.1%. Leading manufacturers of plasma cutting equipment have been identified and profiled in this report, Companies namely, Colfax Corporation, Ador Elding Ltd., Flow International Corporation, Matheson tri-gas Inc., Lincoln Electric Company, Illinois Tool Works Inc., Barton International Inc., Linde group, GCE holding AB, and Fronius international GMBH have been recognized as key players in the global plasma cutting equipment market. In the years to follow, several manufacturers of plasma cutting equipment will introducing high-speed cutting equipment. Moreover, new technologies will be incorporated by market players to extend their capabilities in procuring plasma materials, which will enable their products to facilitate excellent cut quality.